Lisbon’s Emma Houle, left, battles Carrabec’s Katrina Mason for the ball during their teams’ MVC girls’ soccer matchup Monday. 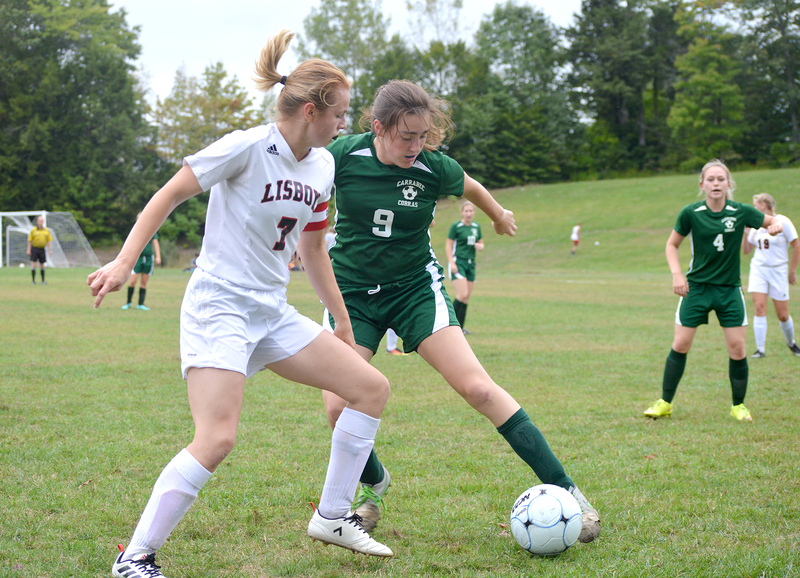 LISBON — The Lisbon girls’ soccer team had offensively opportunities but it was the defense that carried the Greyhounds to a 1-1 tie with Mountain Valley Conference foe Carrabec on Monday. The last three games, the Lisbon’s offense had carried a heavy load, outscoring its opponents 12-3 while going 3-0. Lisbon (3-2-1) came out looking to attack the Carrabec defense early. A near-miss on a header by Lisbon’s Sophie DiGregorio and a nice save by Carrabec’s netminder Ashley Cates on a shot by Emma Houle kept the Greyhounds off the board. Despite being outshot early on, the Cobras (2-2-1) struck first almost midway through the first half when Makayla Vicneire picked up a loose ball and fired it high on Lisbon goalie Anna Willey. It bounced off Willey’s hands, over her head and into the net for a 1-0 lead. The Lisbon offense continued its first half pressure and again nearly scored with under nine minutes to play when Carly Drischler’s direct kick was sent into the middle, but Cates stepped up and took away any chance of a Lisbon player getting a foot on it. With under five minutes to play in the half, Drischler set up for a Lisbon corner kick. The junior lofted a ball in front of the net, where Destiney Deschaines headed it in for the equalizer. “She actually got a facer instead of a header. When she came to the bench after the goal, you could see the ball imprint on her face,” Perron said. The Greyhounds outshot the Cobras 11-7 in the first half, and held a 4-0 advantage in corners. Lisbon once again attacked early in the second half, marching down the field putting a blistering shot on net, but Cates made another nice save. “We needed to play our game, take control of the ball and not let their scorers get chances,” Perron said. Carrabec played hard throughout the half behind strong play of Vicneire. They junior midfielder got a shot on goal after volleying the ball down the sidelines and weaving towards the net. As she slid through a pair of Lisbon defenders, Vicneire crossed a shot that Willey knocked away for a save. Carrabec’s best scoring opportunity of the half came with 13 minutes left when the ball was kicked and ricocheted off a number of legs before being cleared by Savannah Fisher and the rest of the Lisbon defense. “She (Fisher) plays really good defense for us. She’s hungry going after the ball. She positions herself very well,” Perron said. Carrabec once again put pressure on Willey when Lauren Chestnut tried to put a shot on goal, but the senior goalie came out and got the ball. “Our defense is pretty strong. After we moved from a solid four back to a 1-2-1 set up, and I think that helps us because we rotate,” Willey said. Lisbon had trouble getting deep into the Carrabec zone on numerous occasions due to offsides calls. “I think we counted up to nine or so. I’m not sure but it’s something we have to be better at. These girls have to learn how to get their timing down on when to go. 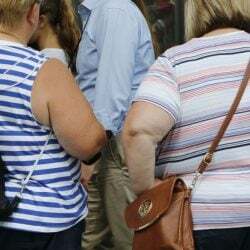 They haven’t done that yet,” Perron said. With the score still tied 1-1, Lisbon tried its best to end the game in regulation in the final two minutes. Emma DiGregorio beat her defender, but her left-footed shot went wide of the net. With 39 seconds remaining, Kiley Merritt got a shot off in front of the net that Cates handled. With the clock winding down, Giana Russo kicked a loose ball in front of the net with the goalie out of position, but the shot popped up and went over the net with 12 seconds remaining. In the first five-minute overtime, Lisbon controlled the ball on their end for the first four minutes, firing two shots on net but again came up empty-handed. “Ashley is playing goalie for us today because our regular goalie is hurt. She was the only one with any type of experience. 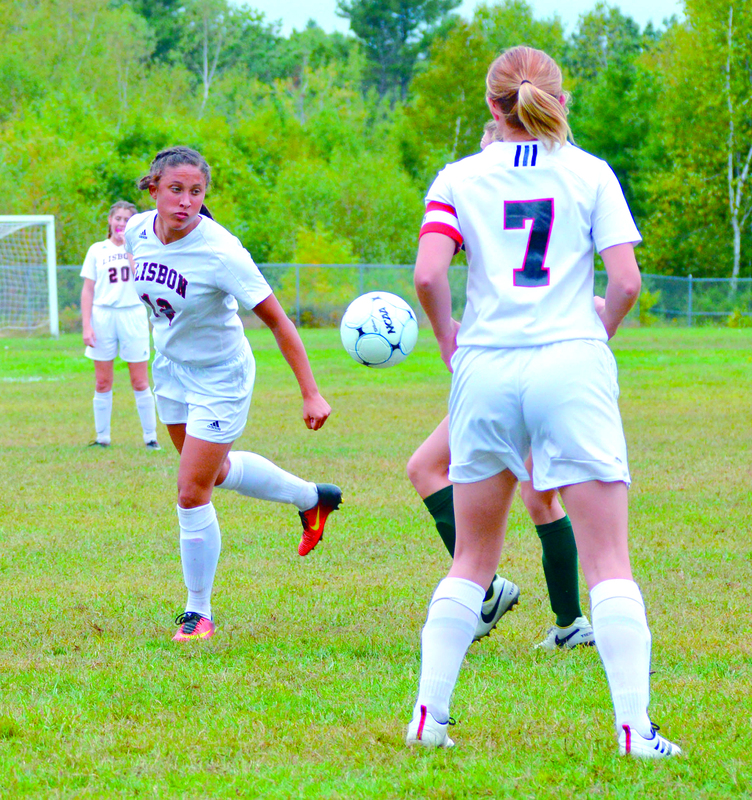 She faced a tough offense today,” Carrabec coach Heidi Vicneire said. Carrabec managed a shot on goal in the overtime, but it was turned away by Willey. The second overtime saw a lot of back-and-forth with no real threat of any goals. Lisbon was able to get a couple of shots off but nothing on net. Carrebec meanwhile could not muster a shot in the final five minutes. Lisbon outshot the Cobras 18-15 and took the edge in corners, 7-3. Willey made eight saves in net, while Cates stopped 12 shots in the loss. Lisbon’s Giana Russo, left, and Emma Houle (7) keep an eye on the ball during the Greyhounds 1-1 draw against Carrabec on Monday. Lisbon goalie Anna Willey tracks the ball during the Greyhounds’ game against Carrabec on Monday.